Axl Rose performed his first show with AC/DC in Lisbon, Portugal on May 7, and video from his debut surfaced online. Rose fronted the Australian rockers on the opening night of the European leg of the 2016 Rock Or Bust tour in place of Brian Johnson, who stepped aside in March on the advice of doctors in order to prevent further damage to his hearing, which guitarist Angus Young revealed had been an issue from the start of the world tour last year. 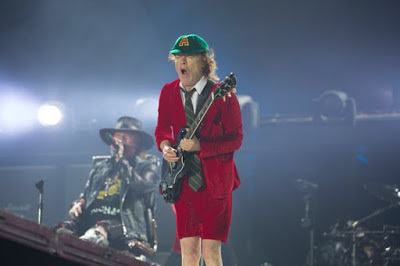 AC/DC and Rose pounded through a 22-song show at Passeio Maritimo de Algés that featured most of the tour’s standard setlist, with two new adds from 1978’s “Powerage”, including “Rock ‘n’ Roll Damnation” (first time since 2003) and “Riff Raff” (last performed in 1996). Check out the No. 4 hennemusic story of 2016 on AC/DC here.